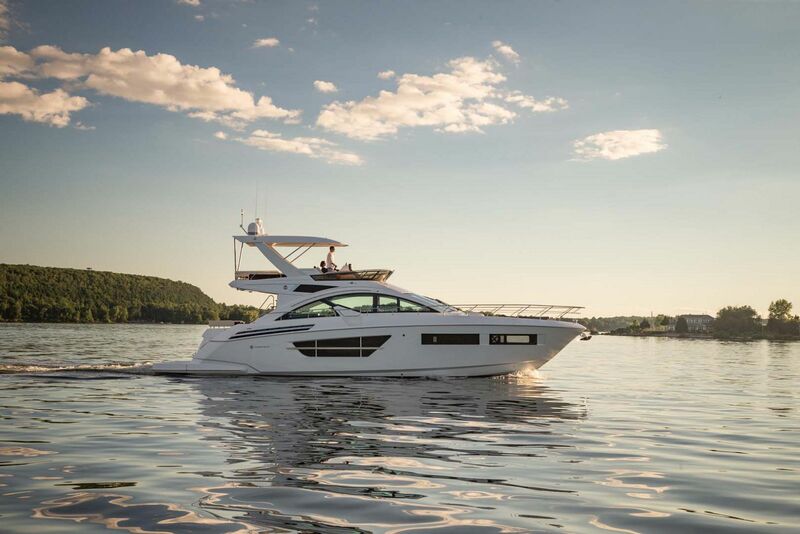 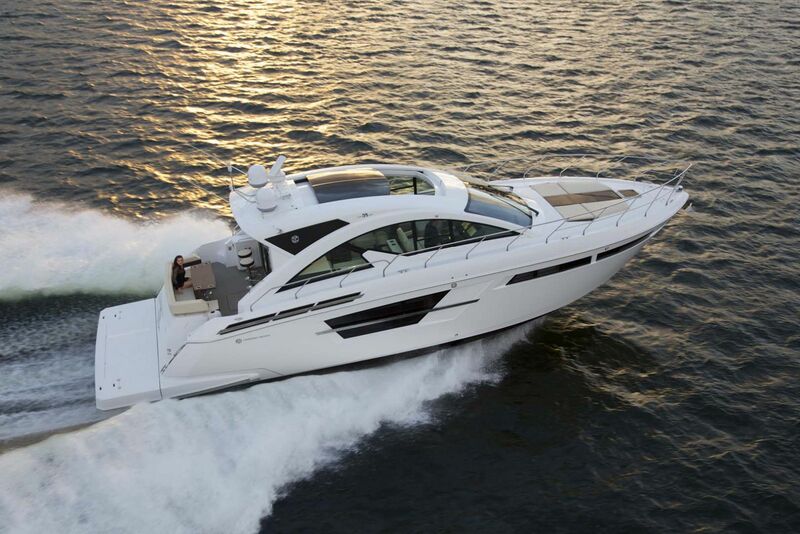 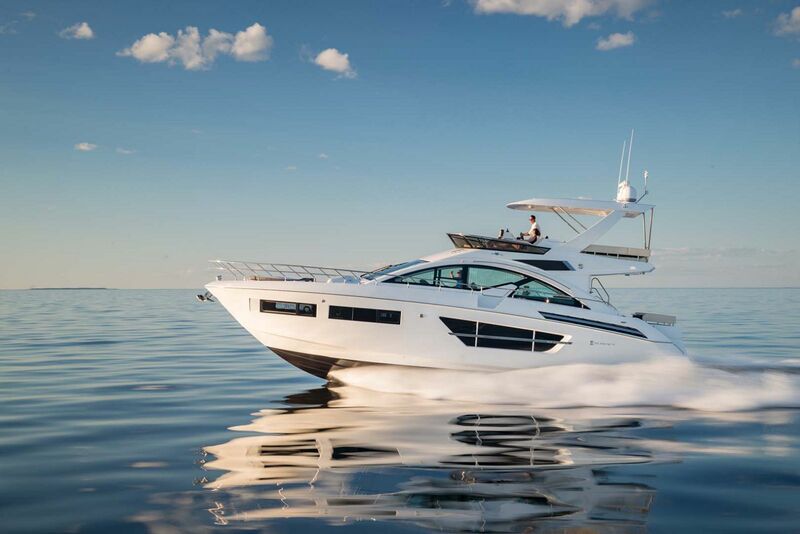 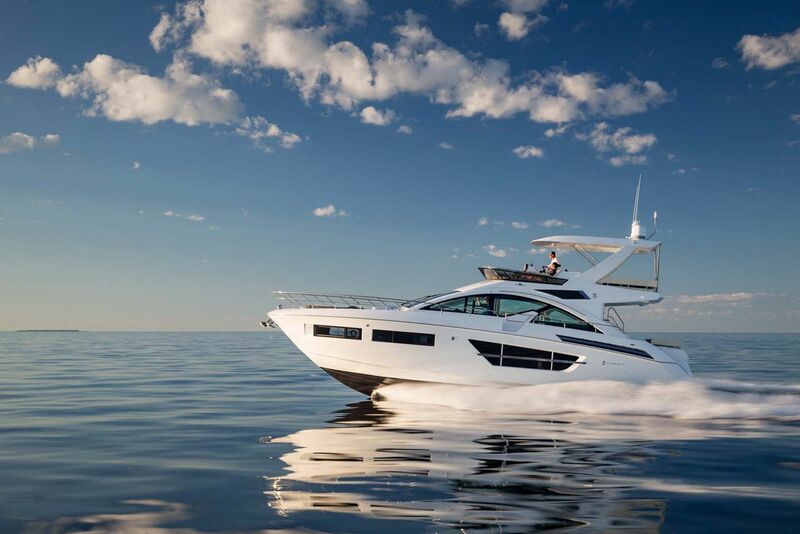 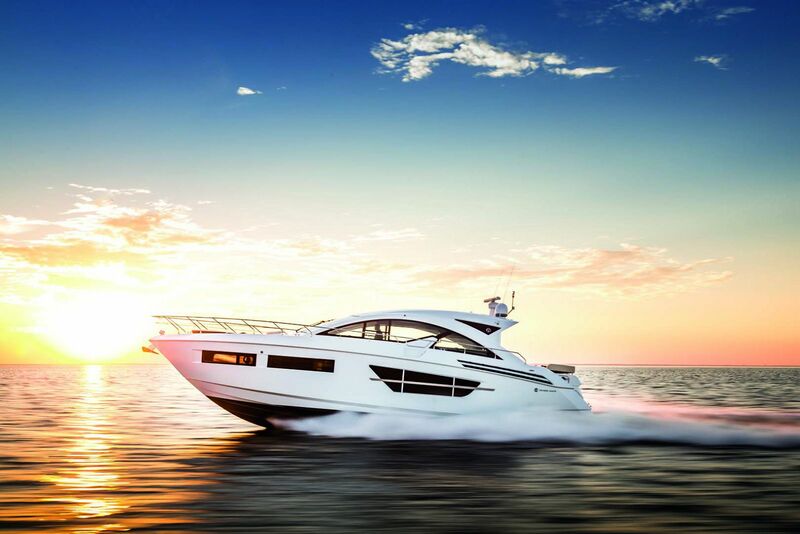 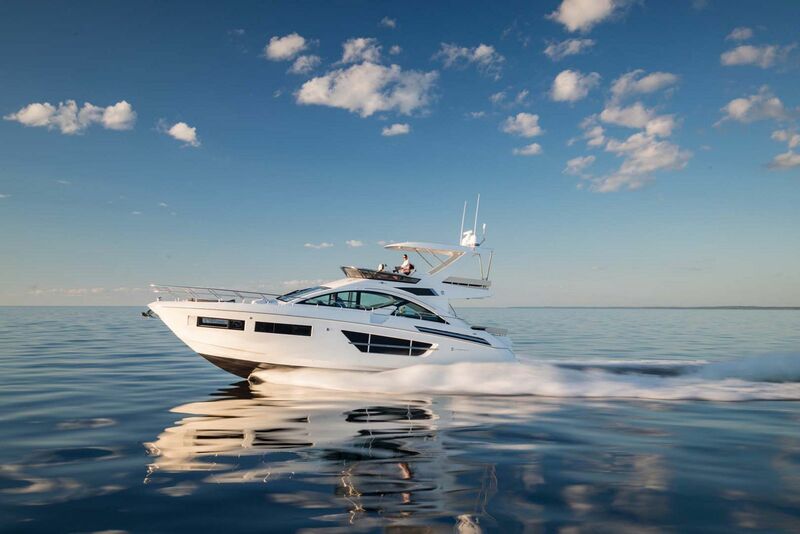 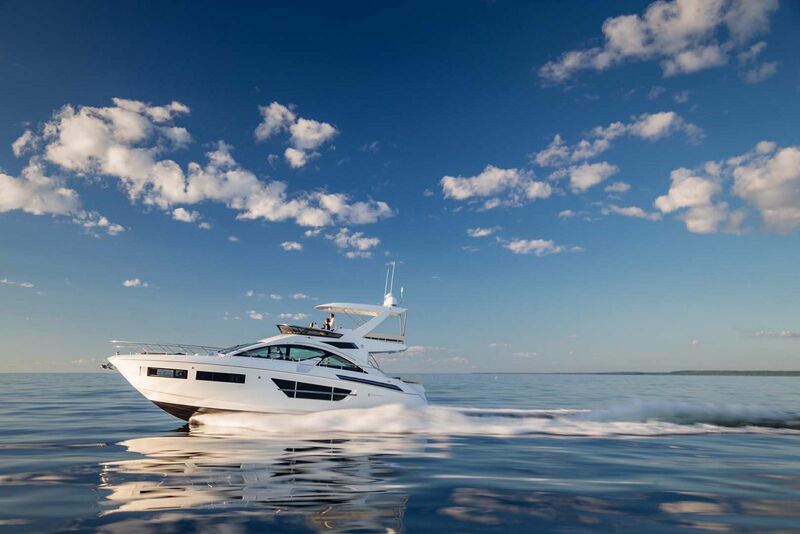 It was only a matter of time before Cruisers Yachts came out with a flybridge version of the popular 60 Cantius, the flagship of the Cruisers fleet. 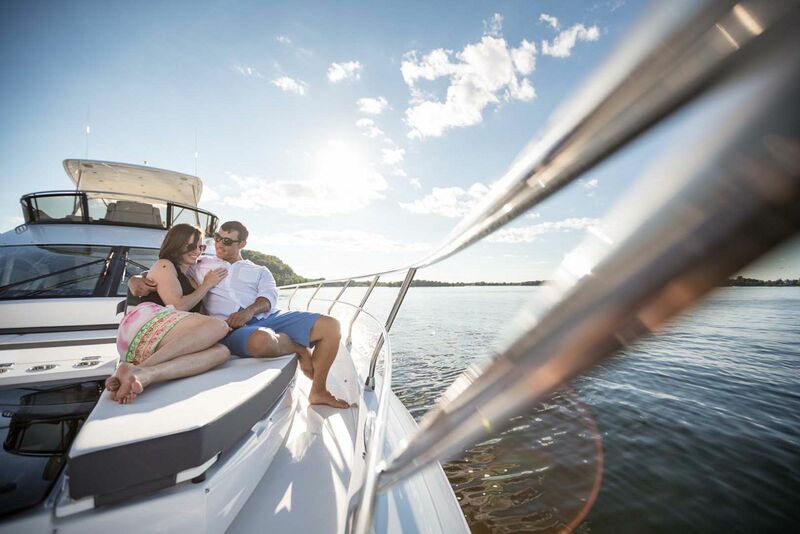 Every inch of the Cruisers 60 Flybridge is meant for fun with lots of entertaining spaces, comfortable seating, and the popular aft galley power window that transforms the cockpit area into its own bar. 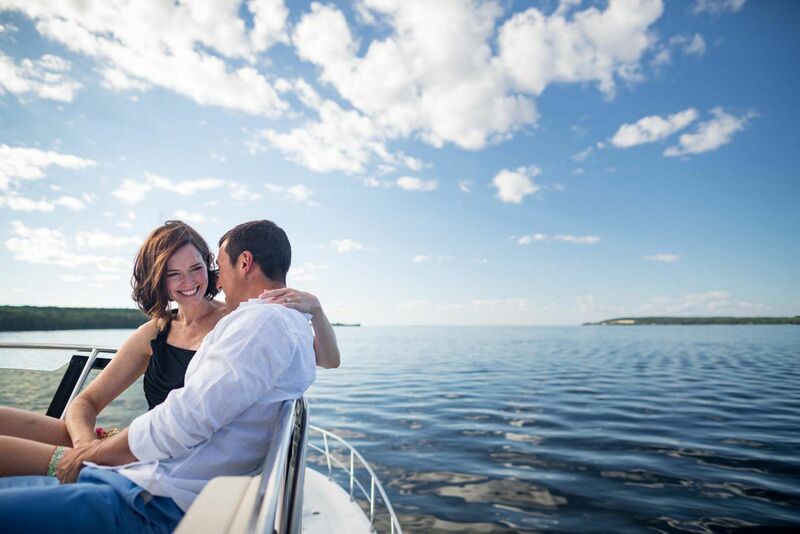 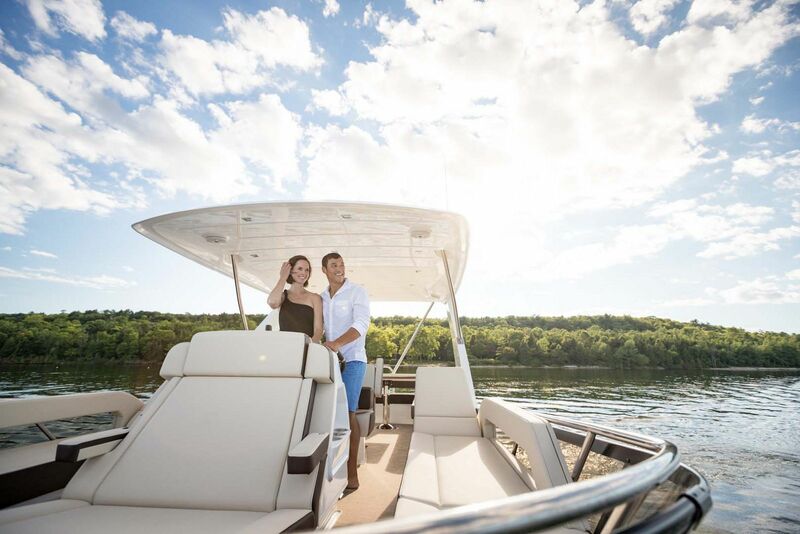 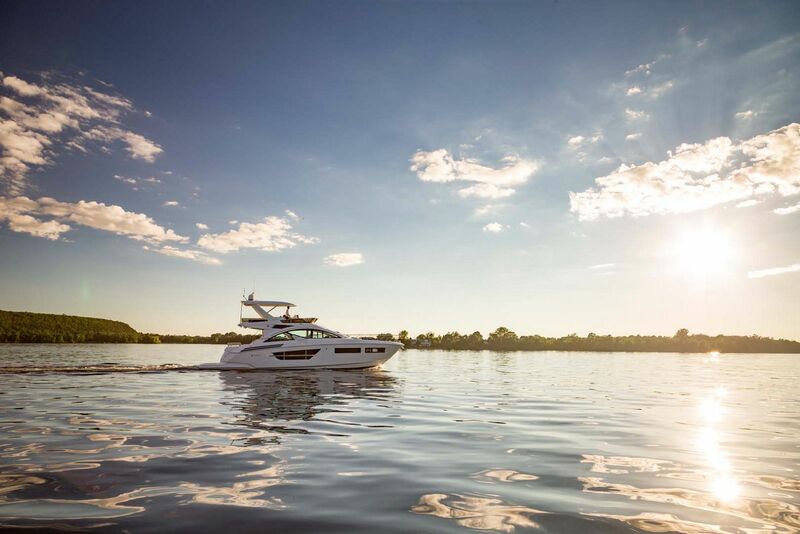 Much of the 60 Flybridge is built with American-made parts and components in the Oconto, Wisconsin factory which means service is easy and construction is of the highest quality. 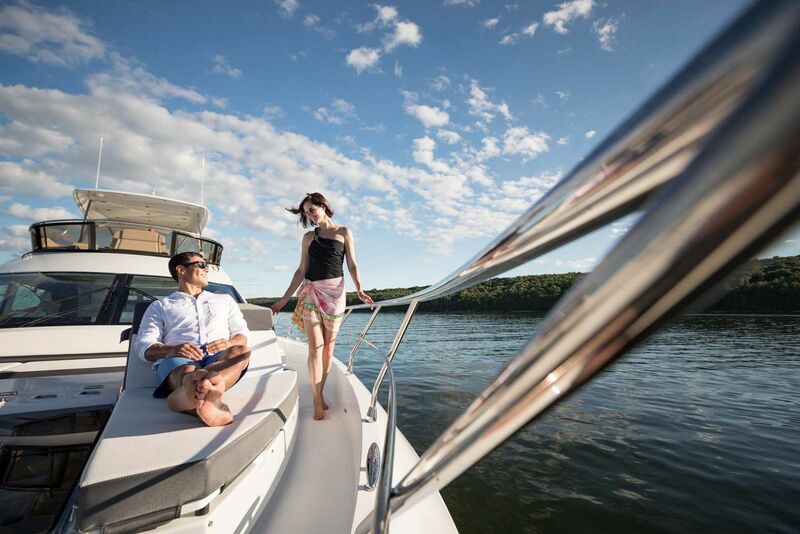 The flybridge is perhaps the most compelling area of the 60 Cantius flybridge as it features a hardtop for shade and protection but also a dynamic layout that is spacious and well-planned. 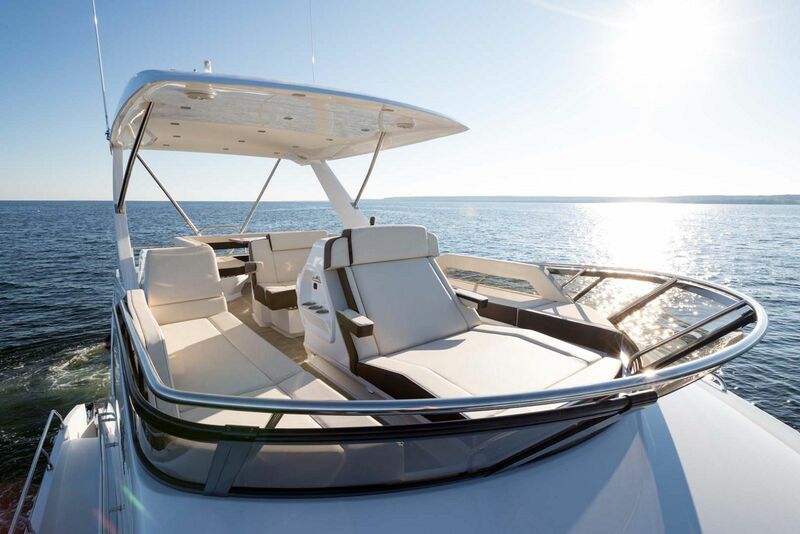 The aft cockpit of the 60 Cantius Fly is a space that is guaranteed to be a popular congregating point on the boat. 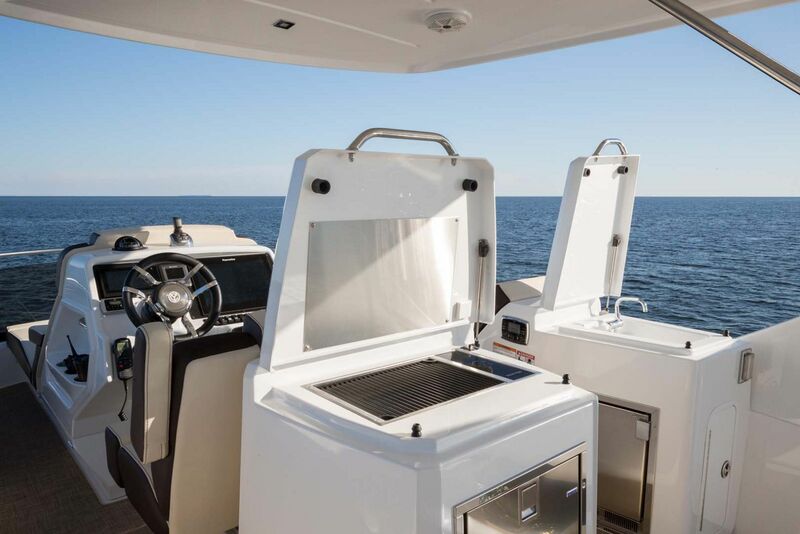 Two bar stools and a fold-out bar offer a convenient place to enjoy a cocktail with the aft power window is raised. 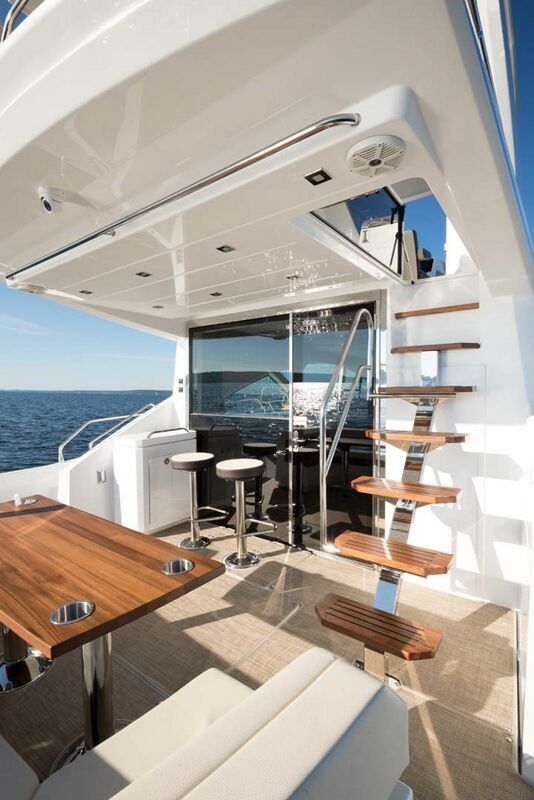 U-shaped seating has more than enough room for 8 people around a teak table that provides a great area to dine outside and enjoy the view. 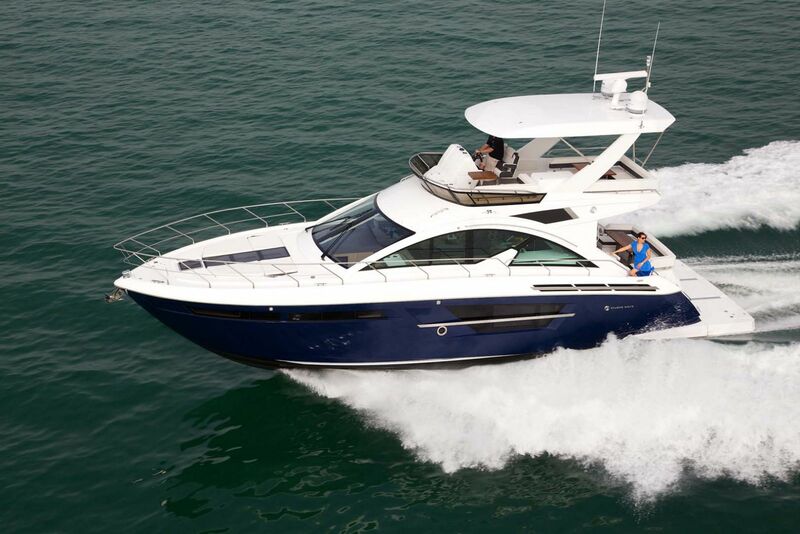 The aft cockpit is also shaded from the overhang of the flybridge offering an extra level of comfort. 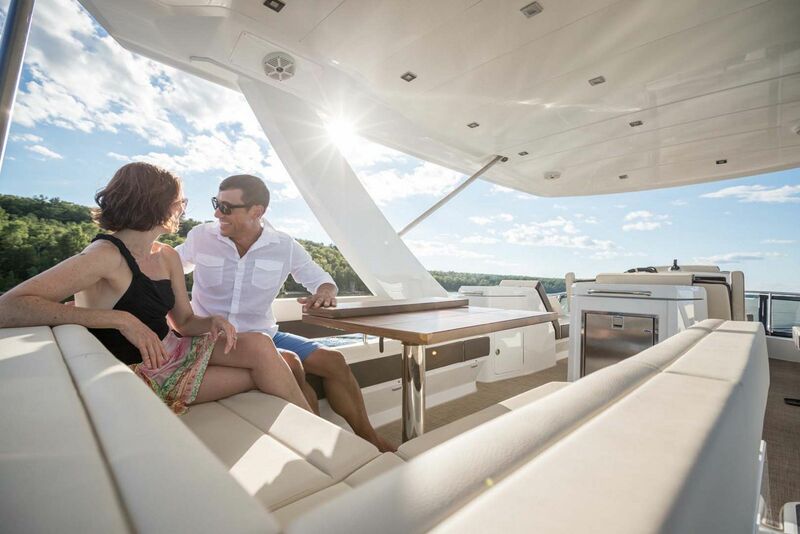 But if getting into the sun is your objective, make your way to the bow of the 60 Flybridge that features a delux lounge. 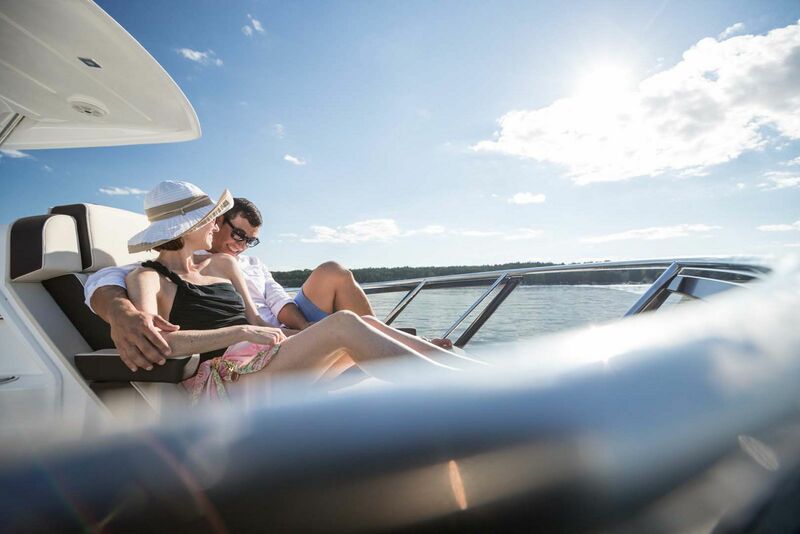 Enjoy the reverse crescent-shaped seating, port and stanboard sun lounges, and large side-mount tables for cocktails. 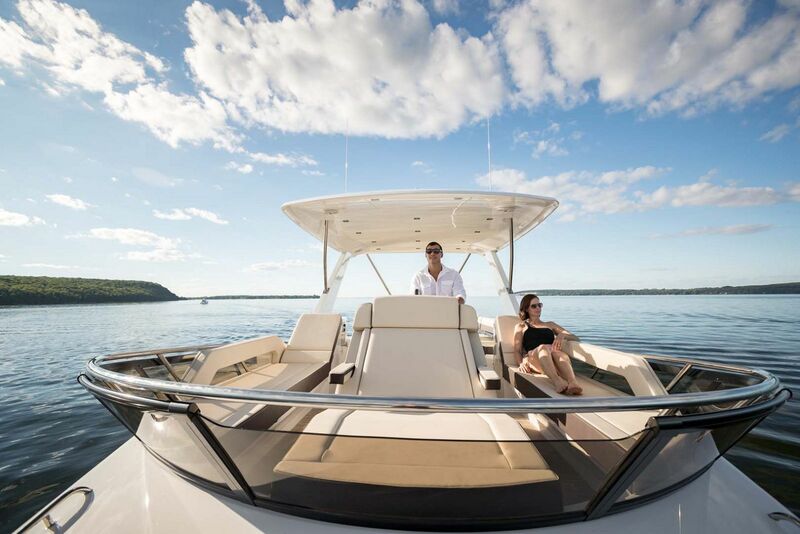 This is truly a sun bathers dream. 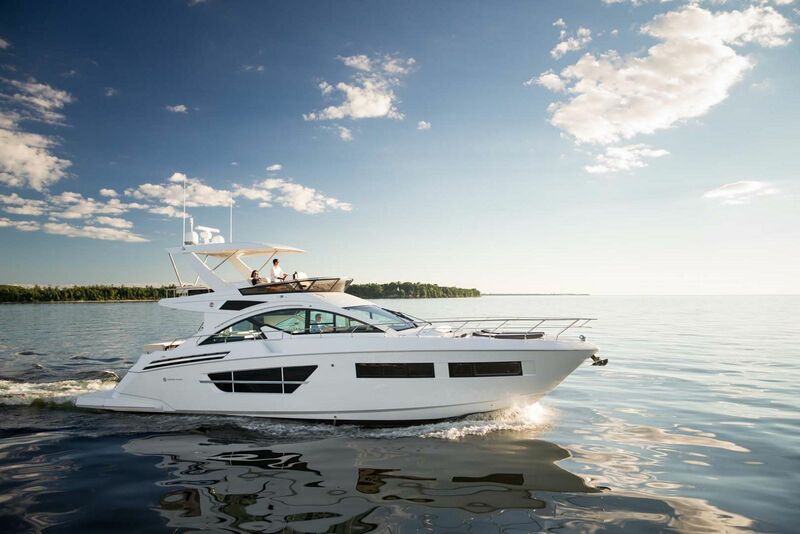 Large hullside windows bring a lot of natural light into the three-cabin layout of the Cruisers 60 Fly. 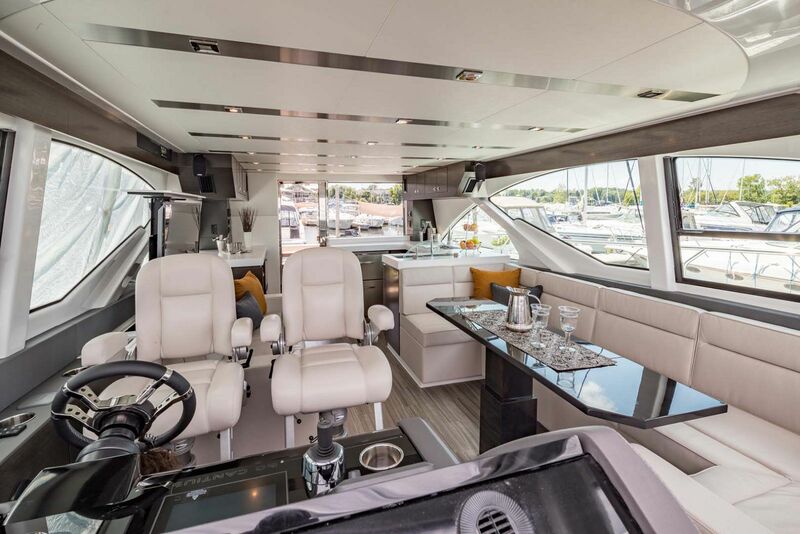 The salon is open and light and the U-shaped couch with dining table near the helm gives guests a great place to sit and relax with the captain while underway or enjoy a meal at anchor.Having the galley aft makes it easy to serve both the cockpit and the dining area. 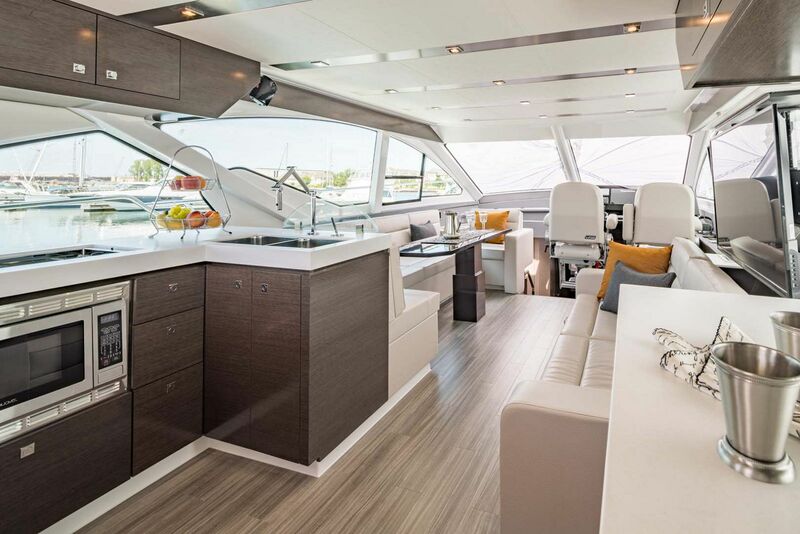 While all of the accommodations on board are stylish with a slight European flare, the master stateroom is exceptionally large. 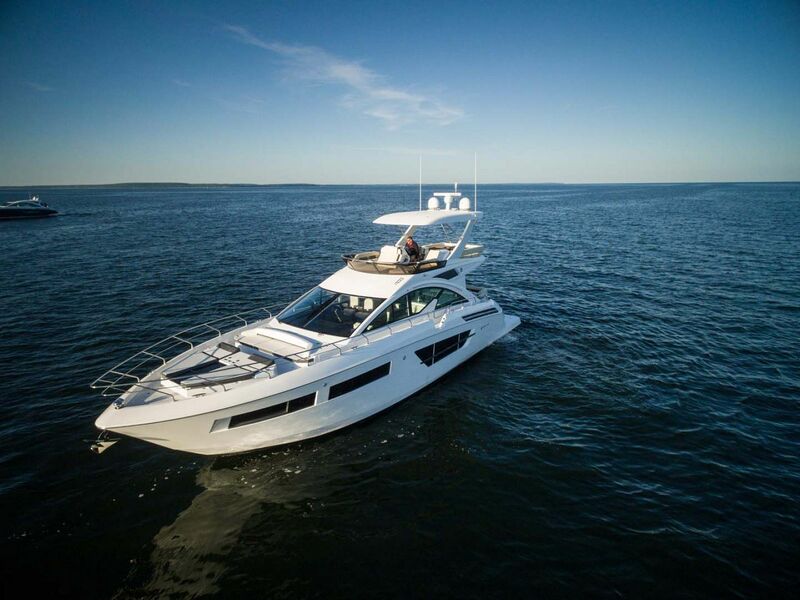 It features a king-sized berth, settee with coffee table, hanging lockers and storage, big panoramic windows with electric blinds, as well as a flat screen television mounted on the wall space. 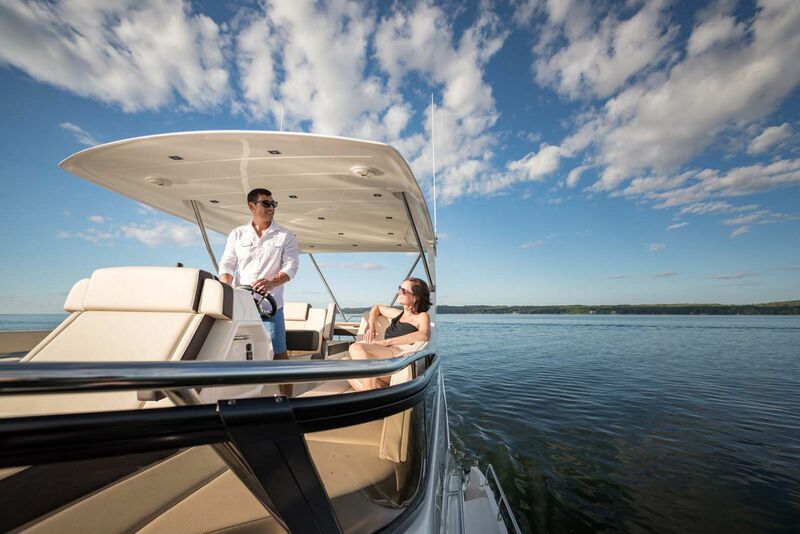 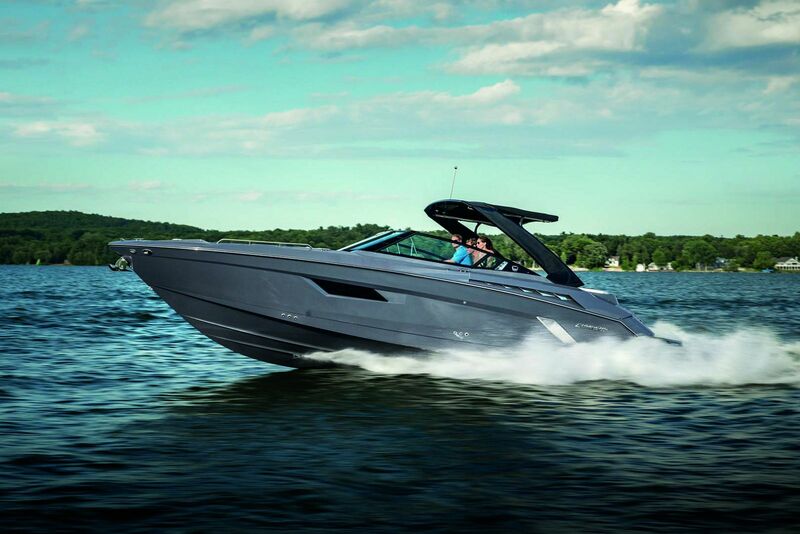 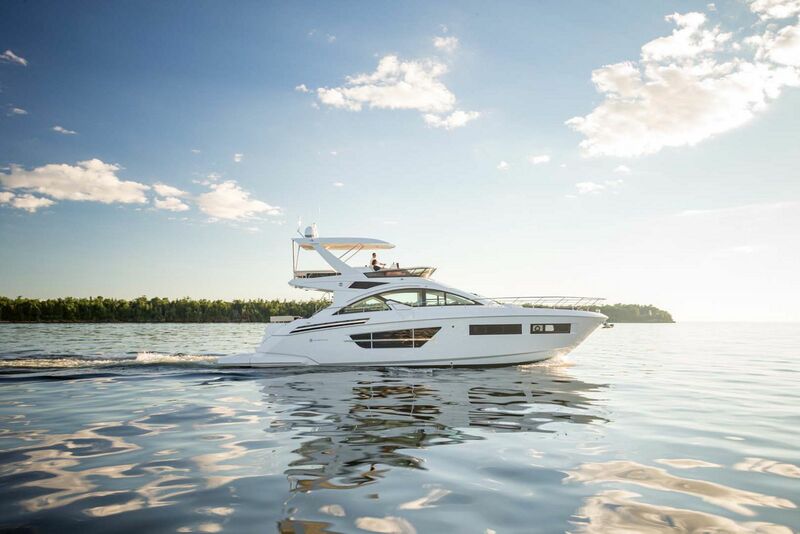 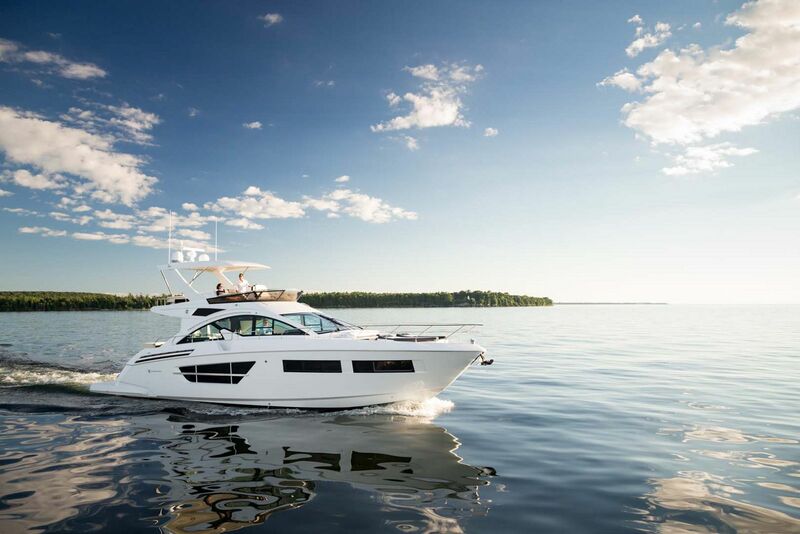 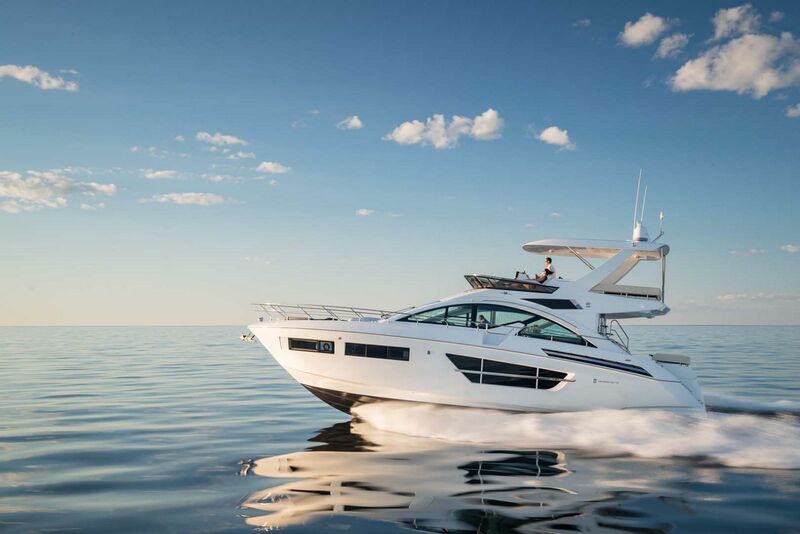 If you're interested in learning more about the Cruisers Yachts 60 Cantius Flybridge, contact your SI Yachts Sales Professional today.